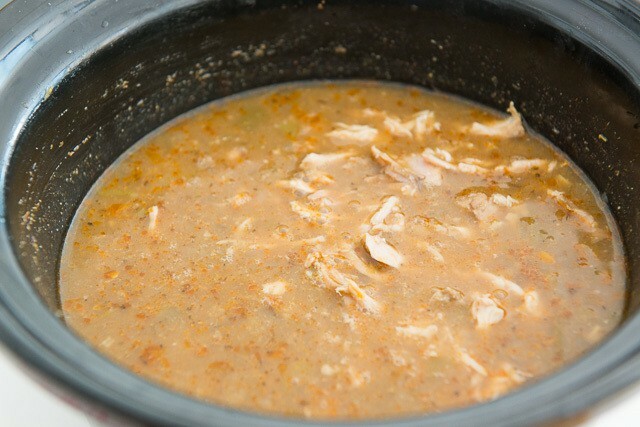 This hearty White Chicken Chili is made in the slow cooker for an easy weeknight meal. It’s a true “throw it in and turn it on” slow cooker recipe, with full flavor and warm spices. I’ve partnered with Swanson® to bring you this recipe. As someone who happens to love the winter season, I agree with this mindset. My appreciation for the cold months is fostered by lots of homemade soup and chili, fuzzy socks, and cuddling up in big fluffy blankets. These things just aren’t as good in the summer, and I’ve talked plenty before about how much I treasure soup season. Whether it’s three bean, tomato beef, or the white bean chicken chili I’m sharing in today’s post, chili is a wintertime staple for me. 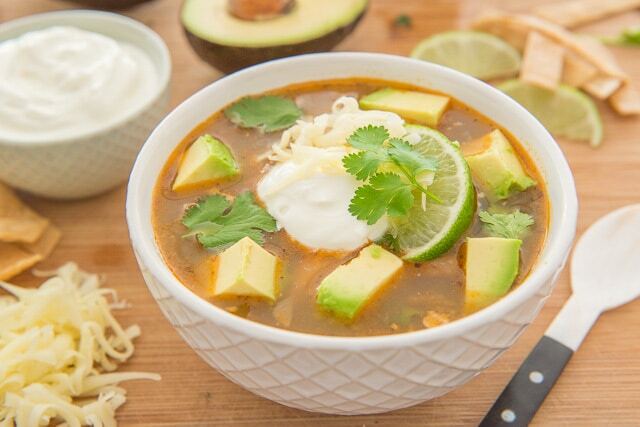 I love a big bowl of chili for dinner, loaded up with fun toppings. Chili often has a lot of ingredients, but it’s easy to make. I used to make chili on the stovetop but I’ve now come to make it exclusively in the slow cooker. The slow cooker has the stove beat for “low and slow” and I find it makes for the most tender and cohesively spiced chili. Plus, when you make chili in the slow cooker instead of on the stove, you don’t have to watch it. This is the biggest reason we all love our slow cookers, right? 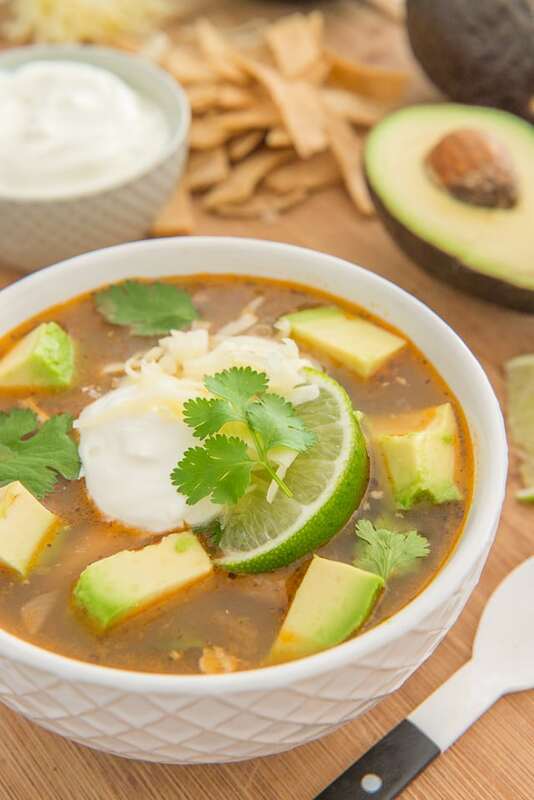 This White Chicken Chili is my third and final recipe for Swanson this season (here are posts 1 and 2 if you missed them), and I wanted to share a recipe that’s really easy to prepare but still has lots of flavor. This chili fits the bill! 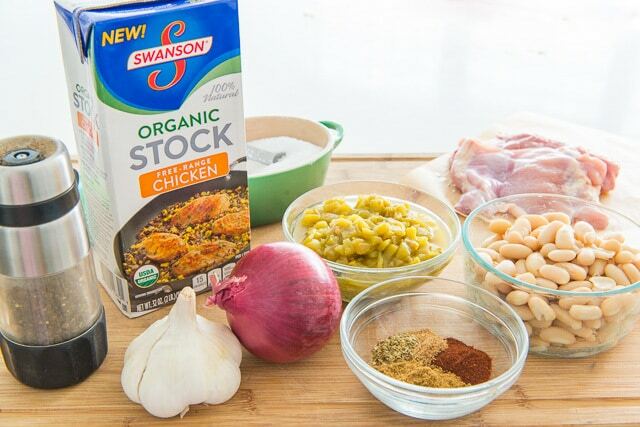 To make the chili, I’m using chicken thighs, white beans, green chiles, onion, garlic, Swanson Organic Free-Range Chicken Stock, salt, and spices. 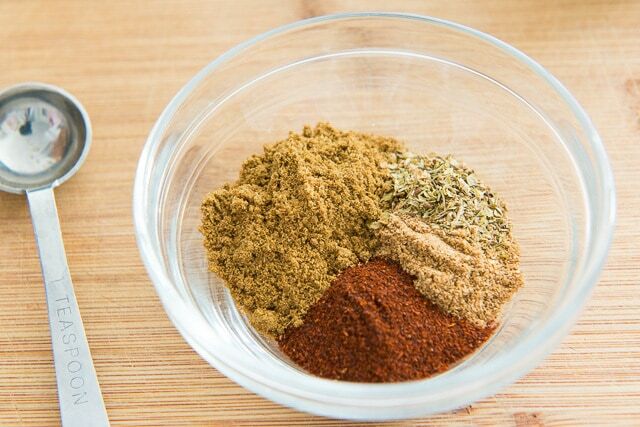 Here’s a closeup of the spices, which are ground cumin, chili powder, ground coriander, and oregano. Even though chili has a lot of spices to flavor the liquid, I always use stock instead of water. 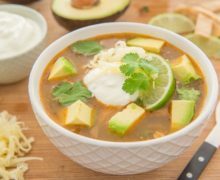 When I see chili recipes suggest adding water, I always think there’s an opportunity to add more flavor by using stock or broth. To get started, season boneless, skinless chicken thighs on both sides with salt, then place into the crock of your slow cooker. 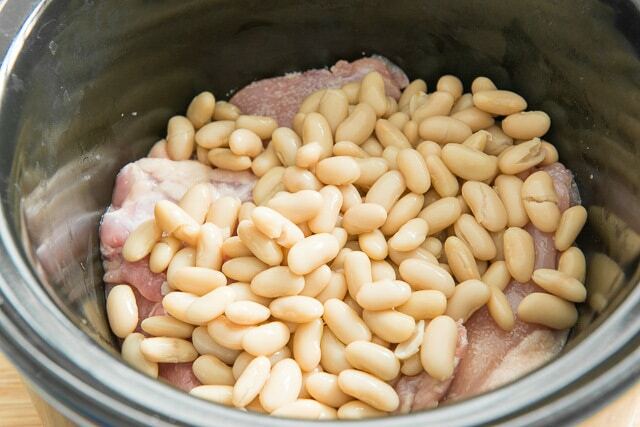 Add rinsed and drained cannelini beans, or another white bean of your choice. Then add diced green chiles. Next up, add diced red onion and minced garlic. Add a few grinds of black pepper and all of the spices. To finish it off, add one 32-ounce carton of Swanson Organic Free-Range Chicken Stock, which is about 4 cups of liquid. 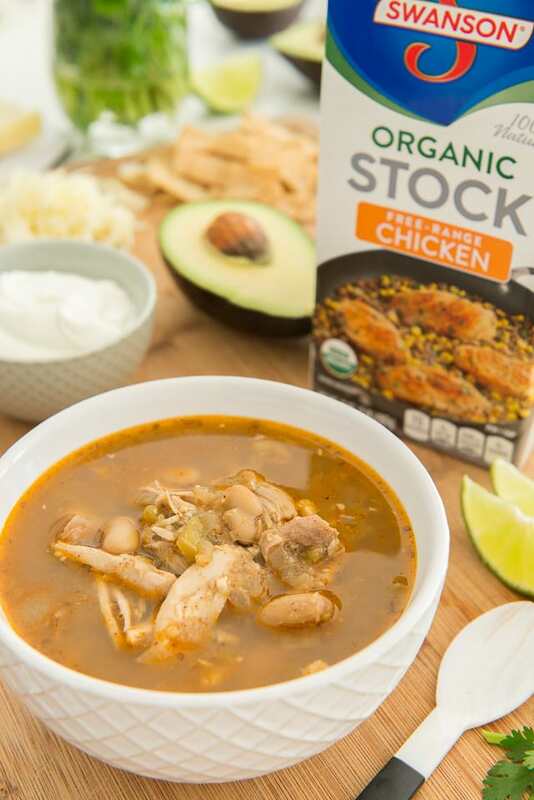 This stock is made with organic vegetables and free-range chicken raised without added hormones or antibiotics. All things I love for the food I eat! 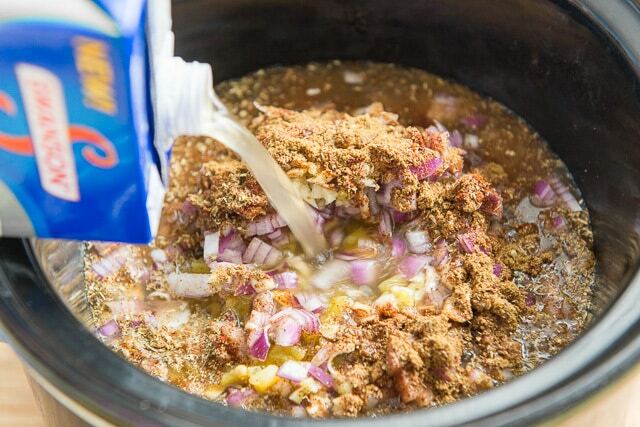 Turn the slow cooker on low for 6-8 hours, or on high for 3 hours. Remove the chicken from the liquid, and shred with two forks. Then remove two cups of the chili, making sure to get some of the beans and chiles in there, and puree in a food processor. 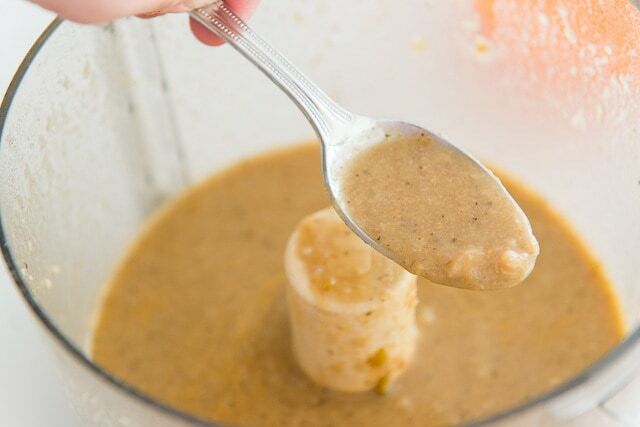 This will give you a slightly thickened consistency. Add the pureed chili and the shredded chicken back to the rest of the chili in the crock. 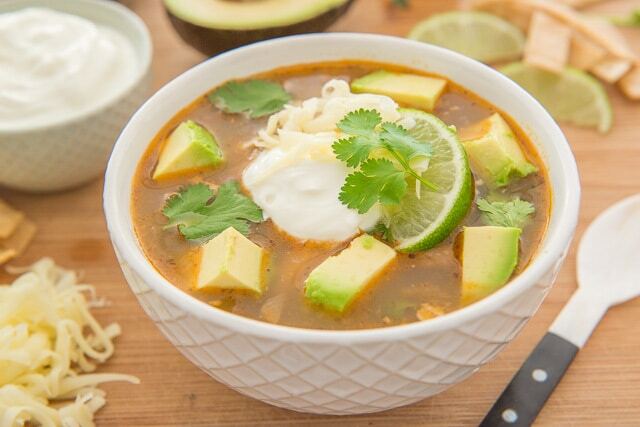 Serve the chili in bowls, and get ready to load it up with lots of toppings. My “always toppings” are Monterey Jack Cheese, fresh cilantro, and sour cream, but I often like to throw diced avocado and a squeeze of fresh lime in there too. 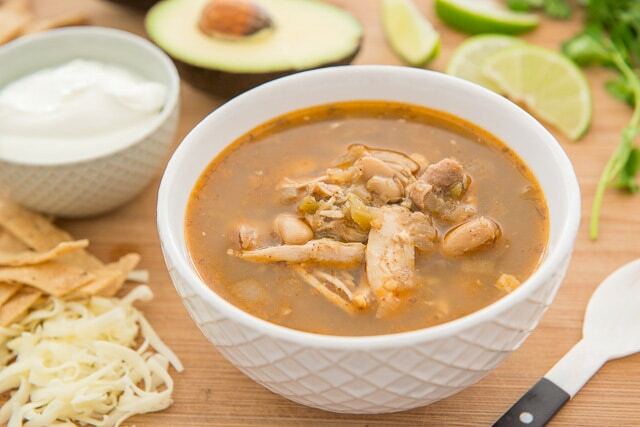 This White Chicken Chili is made in the slow cooker for an easy, simple weeknight meal. 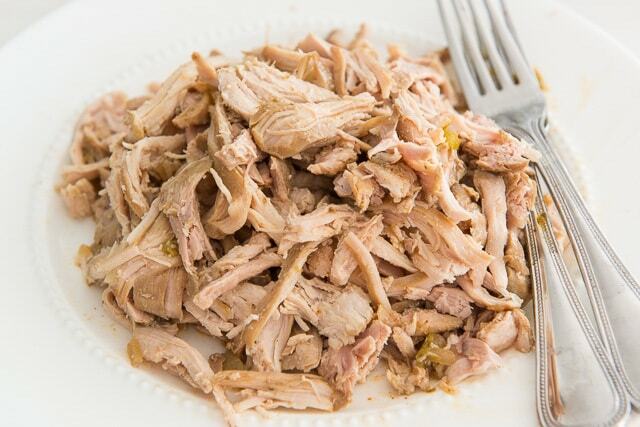 It’s a true “throw it in and turn it on” slow cooker recipe, with full flavor and warm spices. Lay the chicken thighs out in a single layer and season both sides evenly with the salt. 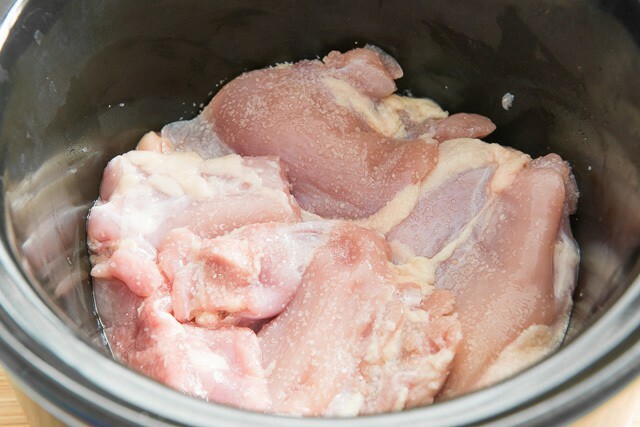 In a slow cooker, place the seasoned chicken thighs in the bottom of the crock. 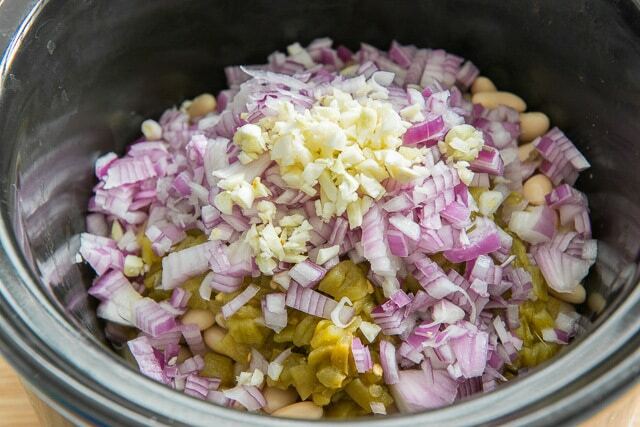 Add the cannelini beans, diced green chiles, diced red onion, minced garlic, ground cumin, chile powder, ground coriander, dried oregano, ground black pepper, and Swanson Organic Free-Range Chicken Stock. Cook on low for 6-8 hours, or on high for about 3 hours, until the chicken is fully cooked. Remove the chicken to a plate and shred with two forks. Set aside. 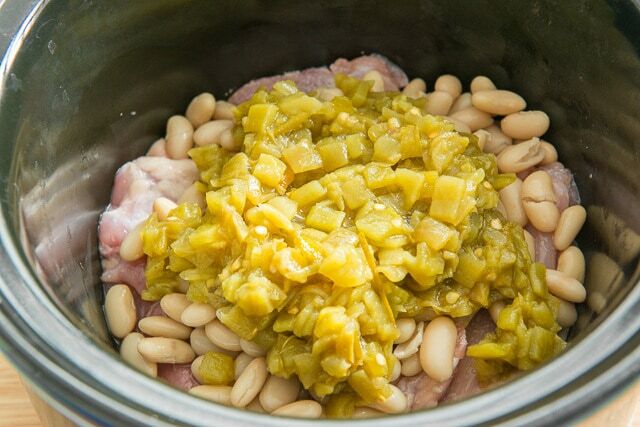 For a thicker consistency, remove two cups of the chile to a food processor (making sure you get some of the beans and chilies in there), and puree until smooth. 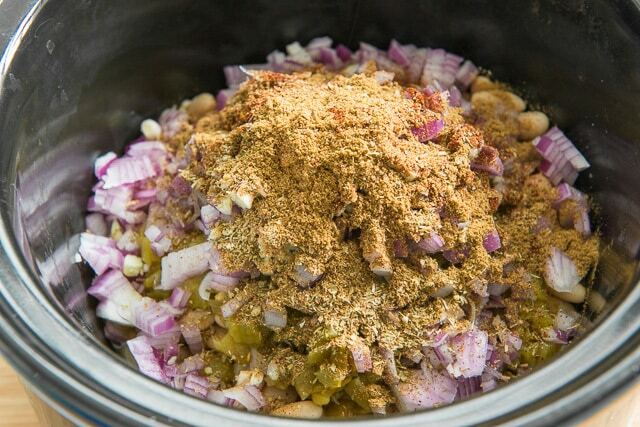 Return this mixture to the crock, and add the shredded chicken as well. Add more salt or pepper, to taste. Serve the chile with desired toppings, and enjoy! Leftovers will keep in the refrigerator for 4-5 days. Oh this looks and sounds so yummy! 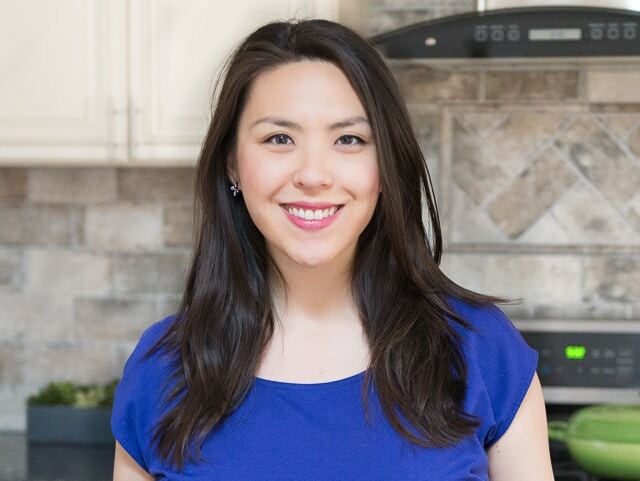 I can’t wait to give this recipe a try at home! So perfect for fall and winter!